William Hooper (born Boston, Massachusetts, 1742; died Hillsboro, North Carolina, October 14, 1790) signed the Declaration of Independence. He represented North Carolina. Born in Massachusetts, he graduated from Harvard and became an attorney. He moved to North Carolina and was elected to the state legislature. Passionate about establishing a new country, he had to hide from the British after they burned down his home. Igor Fyodorovich Stravinsky (born Oranienbaum, Russia, 1882; died New York, New York, April 6, 1971) was a Russian composer. Two of his most famous works are The Firebird and The Rite of Spring. Pam Conrad (born New York, New York, 1947; died Long Island, New York, January 22, 1996) wrote books for children. She received the 1991 Edgar Award for Stonewords. Her book Our House: Stories of Levittown earned a 1995 Newbery Honor Award. Pat Hutchins (born Yorkshire, England, 1942; died London, England, November 7, 2017) wrote and illustrated around 50 books for children. She received the Kate Greenaway Medal in 1974 for The Wind Blew. Children can learn more at: Pat Hutchins. Angela Johnson (born Tuskegee, Alabama, 1961) is a poet. She has also written at least 40 books for children. She received the 1999 Lee Bennett Hopkins Poetry Award for The Other Side. She has earned several Coretta Scott King Awards: an Honor Award in 1991 for When I Am Old with You, the 1994 Medal for Toning the Sweep, a 1999 Honor Award for Heaven, and the 2004 Medal for The First Part Last. The 2004 Michael L. Printz Award was given to her for The First Part Last. Children can learn more at: Angela Johnson. Chris Van Allsburg (born Grand Rapids, Michigan, 1949) is a children’s author and illustrator. He earned a 1980 Caldecott Honor Award for The Garden of Abdul Gasazi. He received the 1981 Caldecott Medal for Jumanji and another Caldecott Medal for The Polar Express in 1985. Children can visit his website at: Chris Van Allsburg. Vivian Vande Velde (born Rochester, New York, 1951) writes books for children and young adults. Her Never Trust a Dead Man earned the 2000 Edgar Award. Children can learn more at: Vivian Vande Velde. Lou Gehrig (born Henry Louis Gehrig in New York, New York, 1903; died New York, New York, June 2, 1941) was a baseball legend. He appeared in seven World Series. 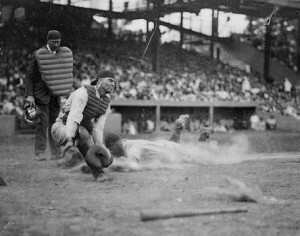 He died of amyotrophic lateral sclerosis, which has become known as Lou Gehrig’s disease. Children could read Lou Gehrig: Iron Horse of Baseball by James Buckley, Jr.
Pascal (born Clermont-Ferrand, France, 1623; died Paris, France, August 19, 1662) was a mathematician, a physicist, and a philosopher. At age sixteen he had developed Pascal’s Theorem. In 1642 he invented the first adding machine. Along with Pierre de Fermat, he developed the mathematics of probability. Elvira Woodruff (born Raritan, New Jersey, 1951) writes for children. Her books include George Washington’s Socks and Dear Levi: Letters from the Overland Trail. Children can visit her website: http://ewoodruff.com/. Annette Curtis Klause (born Bristol, England, 1953) writes books for young adults. Her works include The Silver Kiss and Blood and Chocolate. Robert Kraus (born Milwaukee, Wisconsin, 1925; died Kent, Connecticut, August 7, 2001) was a cartoonist, publisher, and writer of children’s books. His books include Leo the Late Bloomer and Boris Bad Enough. Children can learn more at: Robert Krauss. Jean-Paul Sartre (born Paris, France, 1905; died Paris, France, April 15, 1980) was a philosopher and writer. He received the 1964 Nobel Prize in Literature. Henry Ossawa Tanner (born Pittsburgh, Pennsylvania, 1859; died Paris, France, May 25, 1937) was one of the first African-American artists to have major exhibits. Dan Brown (born Exeter, New Hampshire, 1964) is a novelist. His books include The Da Vinci Code and Inferno. Young adults can visit his website at: Dan Brown. Margaret Sidney (born New Haven, Connecticut, 1844; died August 2, 1924) wrote books for children. She is most famous for her Five Little Peppers series. Children can learn more at: Margaret Sydney. They can read many of her books, including Five Little Peppers, at: Project Gutenberg. Wilma Rudolph (born St. Bethlehem, Tennessee, 1940; died Brentwood, Tennessee, November 12, 1994) was the first American woman to garner three gold medals in one Olympics. She specialized in track events. A polio survivor, Rudolph serves as a model for dedication and hard work. Children could read Wilma Unlimited: How Wilma Rudolph Became the World’s Fastest Woman, by Kathleen Krull. Theodore Taylor (born Statesville, North Carolina, 1924; died Laguna Beach, California, October 26, 2006) wrote at least 50 books for children and young adults. One of his books is The Cay, which received the 1970 Jane Addams Book Award. The Edgar Award was presented to him in 1992 for The Weirdo. His The Bomb earned the 1996 Scott O’Dell Award for Historical Fiction. Children can visit a website devoted to him at: Theodore Taylor. Clarence Thomas (born Pinpoint, Georgia, 1948) is an Associate Justice on the Supreme Court. He is the second African-American to serve on the Supreme Court. Betty Cavanna (born Camden, New Jersey, 1901; died Vezelay, France, August 13, 2001) wrote books for young adults. Her works include Paintbox Summer and Spice Island Mystery. Children can learn more at: Betty Cavanna. Kathryn Lasky (born Indianapolis, Indiana, 1944) has written at least 100 books for children and young adults. She wrote the Royal Diaries series and the Dear America series. A Night Journey received the 1981 Sydney Taylor Book Award for older readers. Sugaring Time was a 1984 Newbery Honor Book. Children could visit her website at: Kathryn Lasky. Jean Marzollo (born Manchester, Connecticut, 1942; died Cold Spring, New York, April 10, 2018) wrote at least 100 books for children. Her books include the I Spy series. Children could visit her website at: Jean Marzollo. Ellison Onizuka (born Kealakekua, Kona, Hawaii, 1946; died in the Challenger disintegration, January 28, 1986) was an aerospace engineer aboard the Challenger. Virginia became the tenth state of the United States by ratifying the Constitution in 1788. It was named after Queen Elizabeth I, the Virgin Queen. Its nicknames include Old Dominion, Mother of Presidents, and Mother of States. The capital is Richmond. Virginia ranks thirty-sixth in area and twelfth in population. Jamestown was settled in 1607, and important landmarks include Arlington National Cemetery and Appomattox Courthouse National Park. Children could visit an Internet site at: Virginia. Idea: Students could find a list of birthplaces of Presidents. Is Virginia truly the Mother of Presidents? Eric Carle (born Syracuse, New York, 1929) has written and illustrated at least 70 books for children. 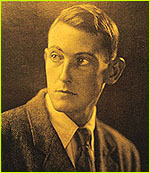 He wrote among other works The Very Quiet Cricket, published in 1990. He received the 2003 Laura Ingalls Wilder Medal for his body of work. Children can visit his website, especially the “download” section at: Eric Carle. Elizabeth Orton Jones (born Highland Park, Illinois, 1910; died Peterborough, New Hampshire, May 10, 2005) wrote and illustrated books for children. She received a Caldecott Honor Award in 1944 for Small Rain: Verses from the Bible. She earned the 1945 Caldecott Medal for Prayer for a Child, written by Rachel Field. Children can learn more at: Elizabeth Orton Jones. Tololwa M. Mollel (born Tarusha, Tanzania, 1952) has written at least sixteen books for children. He now lives in Edmonton, Canada. My Rows and Piles of Coins received a 2000 Coretta Scott King Honor Award for Illustration for E. B. Lewis. Children can learn more at: Tololwa M. Mollel. George Orwell (born Eric Arthur Blair in Motihari, Bengal, 1903; died London, England, January 21, 1950) was a writer. Two of his most famous works are 1984 and Animal Farm. 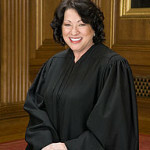 Sonia Sotomayor (born New York, New York, 1954) is an Associate Justice of the Supreme Court. She assumed the office on August 8, 2009. She is the first Hispanic Justice and the third female Justice. Lynd Kendall Ward (born Chicago, Illinois, 1905; died Reston, Virginia, June 28, 1985) created and illustrated wordless books. He used wood cuts for his illustrations. He received a Caldecott Honor Award in 1950 for America’s Ethan Allen, and he earned the 1953 Caldecott Medal for The Biggest Bear. His unusual illustrations sparked interest in graphic novels. In 2011 the Lynd Ward Graphic Novel Prize was established. Children can learn more at: Lynd Kendall Ward.